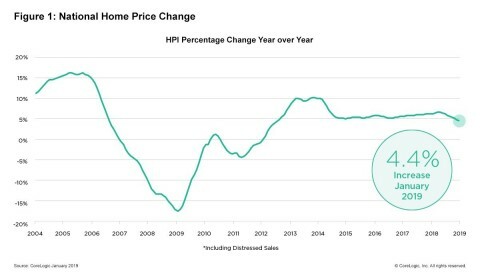 Looking ahead, the CoreLogic HPI Forecast indicates that the 2019 annual average home price will increase 3.4 percent above the 2018 annual average. On a month-over-month basis, home prices are expected to decrease by 0.9 percent from January 2019 to February 2019. The CoreLogic HPI Forecast is a projection of home prices calculated using the CoreLogic HPI and other economic variables. Values are derived from state-level forecasts by weighting indices according to the number of owner-occupied households for each state. According to the CoreLogic Market Condition Indicators (MCI), an analysis of housing values in the country’s 100 largest metropolitan areas based on housing stock, 35 percent of metropolitan areas have an overvalued housing market as of January 2019. The MCI analysis categorizes home prices in individual markets as undervalued, at value or overvalued, by comparing home prices to their long-run, sustainable levels, which are supported by local market fundamentals (such as disposable income). Additionally, as of January 2019, 27 percent of the top 100 metropolitan areas were undervalued, and 38 percent were at value. When looking at only the top 50 markets based on housing stock, 40 percent were overvalued, 18 percent were undervalued and 42 percent were at value in January 2019. The MCI analysis defines an overvalued housing market as one in which home prices are at least 10 percent above the long-term, sustainable level. An undervalued housing market is one in which home prices are at least 10 percent below the sustainable level. The next CoreLogic HPI press release, featuring February 2019 data, will be issued on Tuesday, April 2, 2019 at 8:00 a.m. ET. The CoreLogic HPI ™ is built on industry-leading public record, servicing and securities real-estate databases and incorporates more than 40 years of repeat-sales transactions for analyzing home price trends. Generally released on the first Tuesday of each month with an average five-week lag, the CoreLogic HPI is designed to provide an early indication of home price trends by market segment and for the “Single-Family Combined” tier, representing the most comprehensive set of properties, including all sales for single-family attached and single-family detached properties. The indices are fully revised with each release and employ techniques to signal turning points sooner. The CoreLogic HPI provides measures for multiple market segments, referred to as tiers, based on property type, price, time between sales, loan type (conforming vs. non-conforming) and distressed sales. Broad national coverage is available from the national level down to ZIP Code, including non-disclosure states. CoreLogic HPI Forecasts ™ are based on a two-stage, error-correction econometric model that combines the equilibrium home price—as a function of real disposable income per capita—with short-run fluctuations caused by market momentum, mean-reversion, and exogenous economic shocks like changes in the unemployment rate. With a 30-year forecast horizon, CoreLogic HPI Forecasts project CoreLogic HPI levels for two tiers — “Single-Family Combined” (both attached and detached) and “Single-Family Combined Excluding Distressed Sales.” As a companion to the CoreLogic HPI Forecasts, Stress-Testing Scenarios align with Comprehensive Capital Analysis and Review (CCAR) national scenarios to project five years of home prices under baseline, adverse and severely adverse scenarios at state, Core Based Statistical Area (CBSA) and ZIP Code levels. The forecast accuracy represents a 95-percent statistical confidence interval with a +/- 2 percent margin of error for the index.